With the modern revival of herbal medicine in the Western world, those little amber dropper bottles are what many people primarily associate with herbs. Truth is, people have been steeping herbs in alcohol and calling it medicine for as long as they’ve known how to distill grains and potatoes into moonshine and and other hard liquors. From the bitter white lighting tonics of Appalachia to the aromatic whiskeys of Scotland, humans have long understood the preservative and extractive properties of good hooch. In China and Thailand (and Texas), rattlesnakes and herbs are still macerated in whiskey or other strong alcohol for a purportedly miraculous anti-spasmodic and aphrodisiac remedy. Alcohol-based medicines are reliable, fairly cheap to make and convenient to keep on hand. They remain one of the most popular ways to ingest herbs in most regions of the United States and are growing in popularity in other parts of the world. Here, tinctures refer specifically to an herbal extract made with alcohol or a blend of alcohol and water as the solvent/menstruum. This is the easiest method and probably one of the most common for folk herbalists. Basically, you fill a jar with chopped fresh plant matter, then you cover it with alcohol of some kind (whiskey, rum, brandy, vodka etc depending on who you learned from and what part of the world/country you're from). Cover it with an airtight lid, let sit for 2-6 weeks and then decant, reserving the liquid. It's that easy. This method is a bit more exacting. You don't have to do it this way, but it's useful if you're working with a new plant or one with delicate constituents that you want to be sure to extract. Now, glance at a basic herbal. They will tell you that you will use a ratio of 1:2 for fresh plant tinctures and (usually) a ratio of 1:5 for a dry plant tincture. It's generally accepted in Western herbal medicine that it is most ideal to use 95% alcohol for fresh plant tinctures and varying percentages (with an average of 50%-65%) for dry plant tinctures depending on the constituents in the plant and the kind of medicine you want to make. So, what exactly do these ratios mean anyway? They are weight of herb to volume of menstruum. That means that if you are preparing a dry plant tincture with a 1:5 ratio, and you have 1 ounce (by weight) of dried herb, you'll want five ounces (by volume, in your glass measuring cup) of menstruum (alcohol or alcohol/water). If you are preparing a fresh plant tincture at a 1:2 ratio and you have 5 ounces (by weight) of fresh herb then you will need 10 ounces (by volume) of menstruum. One issue is mass of plant to weight of plant. Some herbs are rather bulky and fluffy and very very light. Trying to chop and smush enough herb into the jar to get the proper ratio can be mind boggling and sometimes impossible. If that happens, you have two basic choices: learn to percolate or just get over it. •	Tinctures are easily transportable and convenient to take, greatly increasing compliance in the client. •	Smaller doses are required, which use less plant matter and require less storage space. •	Some plants only work best when fresh (such as the milky tops of Avena) and alcohol allows us to preserve those properties longer than the short time they are in season. •	Alcohol extracts a wide range of constituents, and while not as representative of the whole plant as a paste, electuary or even water-based preparations in most cases, it is still very often an efficient and practical way of delivering many medicines. •	Many people are sensitive to alcohol or unable to consume it, even in small amounts. •	The energetics of alcohol (warm and diffusive) are not always desirable in certain situations. •	Alcohol is not well suited to tonic remedies in most cases. •	Alcohol can only extract certain constituents and a tincture does not necessarily represent a remedy based on the whole plant. •	Alcohol does not extract minerals efficiently, so tinctures are often less nutritive than other herbal preparations. •	High proof alcohol is expensive and can be hard to obtain in certain parts of the US as well as the world. The average dose for an American-made tincture is generally 30-60 drops (this is an approximation but will greatly vary according to the plant, herbalist and situation. Some very potent herbs should only be taken in drop doses or even diluted drop doses and other very mild herbs are taken by the dropperful. There's this little herbal misunderstanding that has become a pet peeve of mine. Some people seem to think that grain alcohol (sometimes known under the brand-name of Everclear) is somehow unsuitable for medicine because of how strong (evidently this is equivalent to harsh). But really, it's only as strong as you make/need it. Vodka and other common used alcohol for tincturing (brandy, rum etc) usually either 40% or 50% alcohol and the rest (60% or 50%) is water. That makes it Everclear with with a bunch of water added. Expensive water, eh? You can sometimes buy high quality vodka from potatoes or some source besides grain but it's a pretty penny in most places. Now, to make a fresh plant tincture I prefer a high alcohol percentage. I've used every kind of percentage from 40% on up, and I have to say that in most cases, I far prefer a higher percentage (from 75%-95%) because it tastes more like the plant and takes a very low dosage for effective medicine, and seems to preserve better. Now let's be clear, your fresh plant tincture WON'T be 95% alcohol because the fresh plant itself contains water (how much depends on the plant of course), so it's not quite like taking a dropperful of Everclear or something. Some plants have tons of water in them (think of juicy plants like Plantago spp or Mentha arvensis). If you want to only use 50% alcohol for your tincture, then just use half water and half grain alcohol. You can buy ethanol from your local bar or liquor store (if it's legal in your state) or you could buy organic grain or grape alcohol from Alchemical Solutions and have it shipped to you. It's 95% alcohol. If high proof alcohol is not normally legal in your state you can often purchase a special license allowing you do to do so. For dry plant tinctures, you'll rarely use 95% alcohol but it makes it really easy to calculate the exact percentage that you do need. So if you need 45% alcohol for your dried Ashwagandha, then just add enough water to the alcohol to make that (again, appr. half and half). You don't have to get all uptight and scientific about measurement, just approximate and you'll usually do fine. Practice and experience will make it much easier. And yes, the people at the liquor store or bar will think you're an alcoholic. And if you tell them you're making medicine with it, they'll just nod knowingly and roll their eyes at each other over your head. Eventually though, you'll be in there selling THEM little bottles of tincture because they can't get rid of last winter's lung grunge. Poetic justice, I say. 1. If using fresh plants, then fill the jar (without packing the herbs down) with plant matter. If using dried plants, fill the jar about a third of the way full (more for fluffy leaves or flowers, less for roots and barks). 2. If using fresh plants, fill jar completely with alcohol. If using dried plants, blend alcohol and water (usually about 50/50) and then fill jar. 5. Store in airtight bottle in a cool, dark place until needed. 1. Measure 1 part (by weight) of fresh plants, place in jar, then measure 2 parts (by volume) 95% alcohol and pour into jar. 2. Stir to well distribute the alcohol throughout the plant matter. 1. Measure 1 part (by weight) of dried plants and place in jar. 2. Calculate water/alcohol ratio required for plant and blend in measuring cup. 3. Pour menstruum over herb. 4. Stir to well distribute the alcohol throughout the plant matter. 7. Store in airtight bottle in a cool, dark place until needed. 1. Weigh the Yerba Mansa and discover you have about two ounces. 2. Look up or mentally note that dried Yerba Mansa makes a good tincture at a 1:5 ration and 60% alcohol. 3. Measure out ten ounces of menstruum (60% alcohol and 40% water) in a measuring cup. 4. Place plant matter (coarsely ground in a grinder or mortar and pestle) in suitably sized jar (you want to avoid having air space in the bottle when everything is in). 5. Pour alcohol over plant matter, making sure all of the herb is well saturated with alcohol. 6. Seal jar with airtight lid. 7. Store in cool, dark place for four to six weeks. 8. Being a dried plant, shake once every day or so. Fresh plants when tinctured with a high percentage of alcohol do not need to be shaken, they will simply be automatically deprived of all of their liquid bits (near instantaneous cell wall breakdown) by the high proof alcohol. 9. At the end of the designated time, decant (and squeeze squeeze squeeze all the tincture out of the plants) and reserve the liquid. 10. Store in an airtight container in a dark, cool place. Don't open unless you need to as air exposure seems to speed up breakdown time. And don't forget the LABEL, where you want to include what the plant is, usually both botanical and common names. You'll also want ratio, alcohol percentage, date you began the tincture, and perhaps date/location of harvesting. If you didn't harvest it yourself, then the name of the place/date you bought it. So there you have it, a fully functional and very useful tincture. There are further variables of course, as when you're using an herb with lots of tannins you might want to add some (usually 10%) glycerine to the menstruum in order to enhance extraction and avoid precipitations of said tannins. 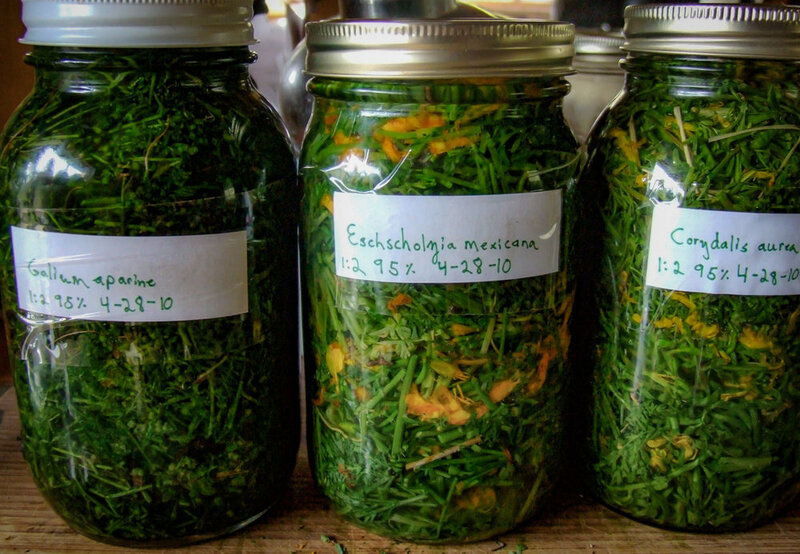 Most herbs, with a few exceptions, make good tinctures. Those exceptions include plants being utilized for their high mineral content and plants with desired constituents that precipitate in alcohol such as polysaccharides and mucilage. Even so, while many people consider an Althea or Malva tincture to be fairly useless, clinical experience has indicated to me that it is still somewhat moistening and certainly strongly cooling and anti-inflammatory and has usefulness for many hot gut and pulmonary type ailments, especially when the powder, paste or other preparations are not available or practical.